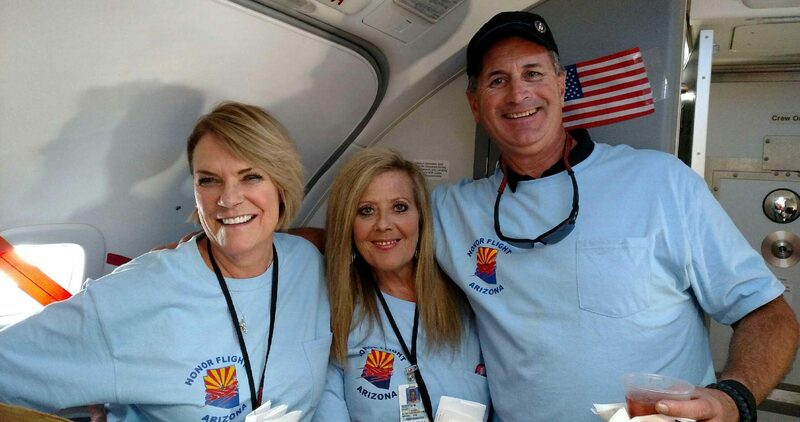 Honor Flight Arizona would not be successful without the generous support of our Guardians. Guardians are volunteers that travel with the veterans to Washington, D.C. They ensure that every veteran has a safe and memorable experience. Duties include, but are not limited to, physically assisting the veterans at the airport, during the flight and at the memorials. Please know that this is a physically taxing trip and that Guardians need to be in good health. Guardians are also responsible for their own expenses (airfare, accommodations, meals, transportation, etc.). The Guardian Fee PayPal buttons are below. The fee is $1150 if you’re flying with us, round-trip, from Phoenix (use the first button). The fee is $450 if you’re meeting us at Baltimore-Washington (BWI) (use the second button). You don’t need to pay the fee until contacted directly by Honor Flight Arizona for your specific date/flight/trip. From the moment the veterans are in our hands until we return them to their loved ones, Guardians are asked to treat these heroes as if they are family and ensure that every veteran has a safe and honoring experience. In return, when you spend time with these veterans, you will experience the trip of a lifetime! For further information, please contact us at (928) 377-1020. Thank you for your support. Please either complete this online form, or download the PDF application.